The retreat was held in Playa Maderas, Nicaragua at Maderas Village. What a beautiful place! It is a little village of lodgings with one building housing the shared dining room and living room. What a special room! This room is where we had our family dinner every night. We all filled around the two long wooden tables, ate dinner together, shared our stories, and had lots of laughs. When the activities of the day finally sent us off to our beds, we headed to our rooms in one of the hut-style casas, casitas, or cabañas. Most of us shared our room with someone else. It was like "summer camp for adults!" as Adriene described it. How fun to share a room with a friend again like when we were kids! It gave us a chance to rehash the day, talk about life, and grow our friendships deeper. I got to share a room with my friend Jennifer. I met Jennifer awhile back when the first YWA Facebook group formed when the REBOOT program was released in January 2014. We struck up a friendship and even spent some time chatting face to face over FaceTime. Both of our moms were nervous about us going out of the country alone. Since we are both from the eastern side of the USA, Jeff from the FWFG YWA team was able to facilitate us meeting up in Miami and flying into and out of Nicaragua together. Hopefully us being together helped to alleviate some of our mothers' worries. It was so wonderful to finally meet her in person! Sharing this experience with Jennifer was one of the highlights of my trip. The scenery all around us was so invigorating and yet relaxing. The green of the jungle was so green and the flowers were vibrantly colored. The birds chirped and squeaked and mixed with the sounds of the exotic howler monkeys and the familiar sounds of roosters. And there were butterflies everywhere! The air was hot and more humid than anything I have ever experienced and yet, we found that our bodies adjusted. And we all agreed that our skin never felt so soft without any need of moisturizer! The air had a pleasant smell that could not be described. It was unique to that environment. As we were walking back from our last yoga session, Jennifer breathed in deeply and remarked that she was trying to take in this smell one last time, knowing that she would probably never smell it again. This group. These people. I could write for days about how beautiful they are. The coming together of all these beautiful souls, open to the experience and open to each other, was what made this retreat so magical. They are the reason this trip was so much more than just a trip. A week was not long enough. Another week or two would have been lovely. The sharing of stories of our lives, sharing laughter and tears, and sharing this experience created a bond that made the heart ache when it was time for us all to fly off back to our little corners of the globe. I miss seeing them all every day. We came from different countries with diverse backgrounds. And yet, we were brought together in this place because of a shared love of yoga, the impact it has had on our lives, and the shared philosophy of living our lives the "find what feels good" way. I could sense in the beginning of the week that many of us, if not all of us, interacted in the same slightly guarded way that we have grown accustom to doing in this modern world. But as the week progressed, a sense of family emerged and as we realized that we were all in this safe place, the walls came down and we spent the rest of the time freely interacting with each other with no guarding and no holding back. I wish we could have had more time of this unguarded interaction. A few of us had a conversation about friendships and adulthood. We shared the sentiment that we treasured the friends we had at home but felt that we did not have as much in common anymore with them as we grew and changed. And we all had the same feeling that we didn't think we could make friends as easily anymore, like when we were children. But this experience helped us see that we still could make friends easily. And not only did we leave this retreat with that knowledge, but we left with new friends too. I can't talk about the people without including the Nicaraguan natives we interacted with. All the natives I interacted with were kind and warm people with a ready smile. Although we were limited in our communication by the language barrier, they were lovely to communicate with. I only wish that I knew more Spanish and could have had actual conversations with them. From the drivers who drove us to and from the airport and up the steep dirt backroads to the village, to the crew on the yacht, and the kitchen staff at the village, they were all so kind and gracious. I would have loved to chat with them more and heard their stories. We began every morning with approximately 90 minutes of yoga. I'll admit that I was a little nervous about how I would do with doing this much yoga in the morning before breakfast and in the heat and humidity. Turns out that the 90 minutes flew by. I was not hungry during yoga and the heat and humidity were not an obstacle either. In fact, the heat and humidity made it easier to move. The heat and humidity made my joints feel great. No cracking or creaking in my joints when I was there. I credit the pain relief in my joints to the amount of yoga I was doing and the heat and humidity I was doing it in. What a welcomed change! Starting every day with a gentle practice that slowly built in intensity then ended with a calming cool down was an amazing way to start the day! By the end of the week my body was craving that start to the day. At home I find it is hard to fit in a morning practice, especially a lengthy morning practice. The obstacle to overcome is to figure out how to create space for a regular morning practice like this at home. Everything flows better when the day is started off in this way and not with lateness and rushing around. Since we all practice at home with Yoga with Adriene, when we came together and practiced there was a unity in our flow and our energy. 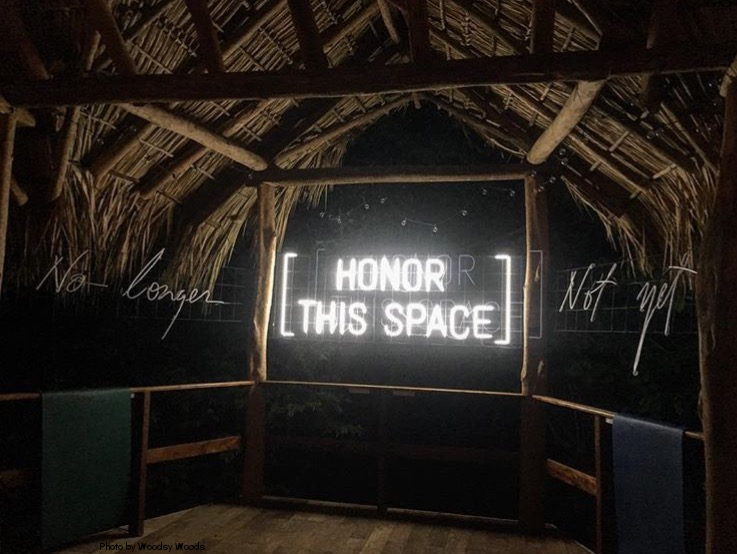 To be in this space with 30 people and feel that connection flow through the room was a powerful thing. And keeping with the FWFG philosophy, modifying and making the practice our own was encouraged and embraced. We were also challenged to meet our edge too. Personally, I felt that I met my edge during our practices unlike when I am at home. The group morning practices rejuvenated my home practice, even though I wasn't aware that my home practice need rejuvenating. I am excited about my home practice and looking for ways to take some of the elements from our practices at the retreat and work them into my home practice. I am also excited about expanding my practice to include some public classes occasionally too. I value my home practice but now I see the added value of a public class too. Both have benefits that I want to cultivate in my yoga practice. Most of the late afternoons we had yoga workshops. This was my first experience with a yoga workshop and I am hooked! Yoga workshops are a more casual settling with the opportunity to focus more intently on a particular asana or other element of the practice. It is also an environment to ask questions in and experiment in. I loved our afternoon workshops! I learned so many little techniques in the workshops that I was able to take home with me, share with my husband, and incorporate into my own practice. I thought I had my tabletop position and down dog nailed, but during the workshops I learned little changes to both these asanas that have really upped my game! I even learned how to improve my crow asana and do it in a way that my knees no longer hurt the backs of my arms. Good stuff! I also was able to strengthen my breathing practice and utilize it more regularly in my practice. Breath is such an important part of a yoga practice but is often forgotten about when trying to work through a challenging asana. Our Ujjayi Breath practice workshop helped me see that if I truly pay attention to my breath, that has the power to help me go further than I thought possible and truly meet my edge. The combination of the morning yoga practices and the afternoon workshops were valuable experiences and I left really excited about my practice and with my practice honed in better than when I arrived. The first thing that struck me was the realization that Nicaragua is not really that far from home. Geographically it is truly a lot closer than I realized. I obviously knew where it was on a map, but since it is in Central America it seemed far away, almost like another world away. But it truly isn't far from us at all. It is only a two and a half hour plane ride from Miami. For some perspective, it takes 2:50 to fly from Miami to NYC but only 2:30 to fly from Miami to Managua, Nicaragua. Nicaragua may have less economic freedom than the USA but there were many similarities I could see between our countries. We have many cities and areas in our country that have limited economic freedom as well. There were also similar sights there that we see here at home, like Remax, Burger King, and Budget Rent a Car. Then on the flip side, there were families piled on motorcycles, horse drawn wagons, and crowded buses. There were houses that looked as though they were put together with spare parts, but there were also larger well-built homes too. The signs of poverty and prosperity around the poverty made me realize that my country is simply one bad economical event away from being in a similar place as Nicaragua. Again it made me realize how close our two countries are. It made me grateful for the prosperity we have but it also sobered me to think about how quickly we could be in a similar economic place. I also give credit to the Nicaraguan people for what I saw of their work ethic and ingenuity. I wonder if my country would fair as well if we experienced similar economic struggles. Overall, the trip to Nicaragua made me realize how much there is of the world to see and how important it is to get out there and experience it. It is good for us to stretch ourselves beyond what we know. It is good to get some perspective on how other people in the world live. And most importantly, it is good to see other parts of the world and meet people from around the world to broaden one's mind. It is hard to remain egocentric regarding one's country once you have met others from around the world. We truly are all the same, simply in different geographical locations. Seen at the Miami airport. Another thing I took away from this experience was what I mentioned earlier about making friends as an adult. We are never beyond the point of making new friendships based on mutual admiration and respect. So often as adult we find ourselves making friends around convenience, making friends with our coworkers, with our neighbors, with our children's friends' parents. Nothing wrong with these friendships and they are to be valued in their own right. But to go out as an adult, find someone you like, and ask them "can we be friends?" as easily as we did when we were children, that kind of friendship building seemed out of reach. I learned this trip that it is not out of reach. In fact it is very much in reach as long as we are willing to put in the work looking for it and be open to it when we find it. Photo courtesy of Chris Sharpe. The last big perspective shift I took away from this experience was regarding self-love. Adriene is a big proponent of not only talking to ourselves with love, but also using the power of touch to show love to ourselves. In her videos she will often prompt us to massage our muscles as we work them. At the retreat we had lengthier practices and therefore more time for self-massage. It hit me during the last practice that while I have been trying to practice self-love, it has been mostly all talk and no action. But after a week of lovingly massaging my muscles as I practiced, I could actually feel the love I was directing toward myself on that last day. I honestly can't even remember the last time I felt that. Self-love in our thoughts is important but it can only take us so far; self-love in action, through our touch, is indeed a powerful thing! I am so grateful for the opportunity to go on this adventure. It has changed my life and set some wheels in motion that are directing my life's course in an exciting direction and in a direction that fits with who I am and what I value. Thank you, Adriene and Chris for creating this community and for your vision for this FWFG retreat. You have created a wonderful thing! Thank you for your hard work and dedication. I believe that because of your hard work and vision this community is creating little ripples of love all around the world. And I believe those ripples have the power to grow and spread. You are doing important work and changing lives. Thank you!! Thank you, Jeff for all you did to help make the travel smooth for Jennifer and I so that we could travel together and bond over this shared experience. You are a travel guru and an all around funny and wonderful person! Thank you to Mark from Trip Tribe, who took Adriene's vision for a FWFG retreat and made it happen! Thank you to all you beautiful people with whom I shared this amazing retreat experience. I am so grateful to have met you all and to be able to call you all friends. You will forever be my retreat family! It was an honor to get to know you.